Inspired Intentions – Critical Hit! **Minor spoilers for Portal 2… but let’s be honest, if you haven’t played it at this point, are you planning on it? There is a certain dependence between audience and creator that is inherent and unique to video games. That said, this dependence adds a layer of challenge for content producers but allows for more success in conveying their message to the audience. To do this, creators function upon what we shall call “inspired intentions” which is to say the ways in which a game makes us do what we are meant to do. This is frequently accomplished using the weak trope of objectives in some popular games but is a much more complex process for the ones that do it well. Courtesy of the IGN wiki. 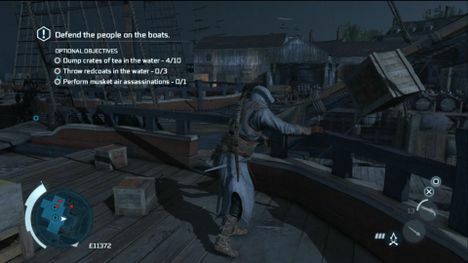 AC is guilty of relying on objectives–even though it is a series I enjoy. I think Portal 2 is one of the best games I have played for inspired intentions, so it will function as my overarching example. A great score can do wonders for inspiring the right emotions in the player. Portal 2 has–in my opinion–one of the best scores across all entertainment because of its ability to do so. The score always makes us want to run away when we have to, makes us pensive when we can be, and establishes any mood from eerie to exciting. However, it even goes beyond this by being ambient. It is perfectly camouflaged with the player’s surrounding because it sounds like the harmonizing noises of a machine–brilliant, to say the least. But, let’s be honest, I’m not a music analyst, so let’s get off this topic ASAP. Furthermore, it is well known that people’s attentions are attracted by actions. 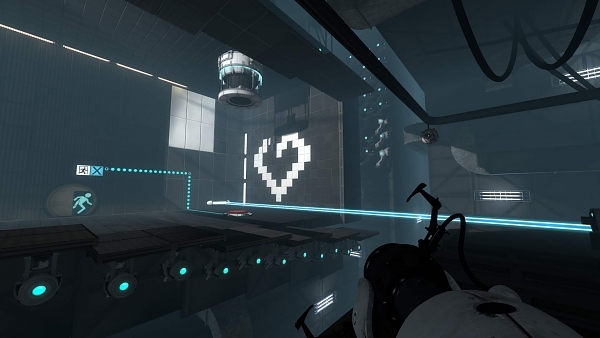 By adding scenery movement (along with the right lighting), Portal 2 subtly suggests where the player wants to go. In the escape scene, for example, walls disappear and a light bridge appears in the direction the player is intended to run. On top of all this, Portal 2 benefits from a well written plot and strong characters that make it easy for the player to merge identities with the main character, Chell. Among academic discussions of video games, inspired intentions should be one of our top analysis priorities across the board. It always struck me as odd that the Horror genre tends to get a decent amount of critical acclaim in the video game industry while Horror movies are scoffed at, but it is because Horror games make us perfectly empathetic towards the character–both player and character are terrified and want to run away. What games do you think are good at inspired intentions? How do they make you empathize and/or sympathize with the main character? Leave a comment and let me know what you think. Pingback: Quick Crit! Inspired Intentions | Critical Hit!